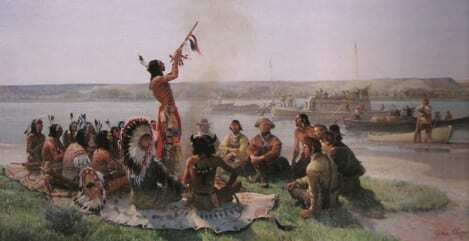 The Corps of Discovery participates in a Lakota Pipe Ceremony along the Missouri River. Northern Plains people were all different in their own backgrounds and languages, but they all shared a common approach to thriving in the “Big Sky” or “Medicine Wheel” country. Moving with the seasons is one of the key concepts for students to understand. The hunting-gathering-trading culture of the Northern Plains remained largely unchanged for over 13,000 years. The Northern Plains people chose not to invest their time in farming crops such as corn and beans because their land was already rich with wild food and the weather made farming a severe challenge. What were the key aspects of ancient life on the Northern Plains that allowed tribal people to thrive throughout the year? How did the unique qualities of the Northern Plains influence the tribal cultures of history? The Northern Plains is an area of great movement, where all the tribes moved in a seasonal cycle, trading and interacting with one another throughout the year. The class can create a K/W/L chart to prepare for reading the passages. A K/W/L chart identifies what the class knows already about the topic of the Northern Plains traditional tribal life. The W column contains the questions or the “what we want to know” about the topic, and after finishing their assigned reading, the L, or what we learned. For questions that are not answered within the readings, students can do individualized research on their own using their classroom resources and the Internet. A concept map of traditional tribal culture on the Northern Plains is created by student groups of four. 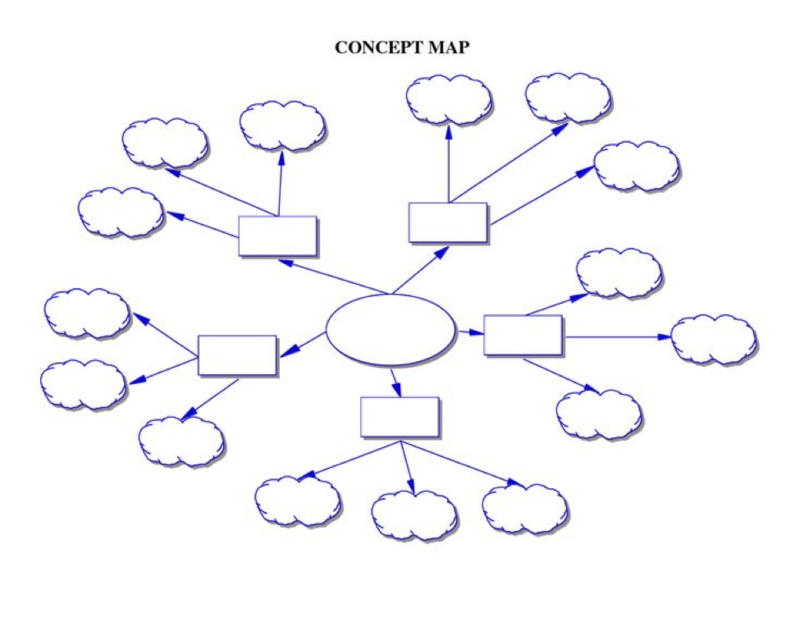 The concept map utilizes information from the K/W/L chart. The Concept Map and K/W/L chart are the starts of chapter focusing on indigenous languages of the Northern Plains, and this background knowledge is important to understanding the nature of the culture in the region. 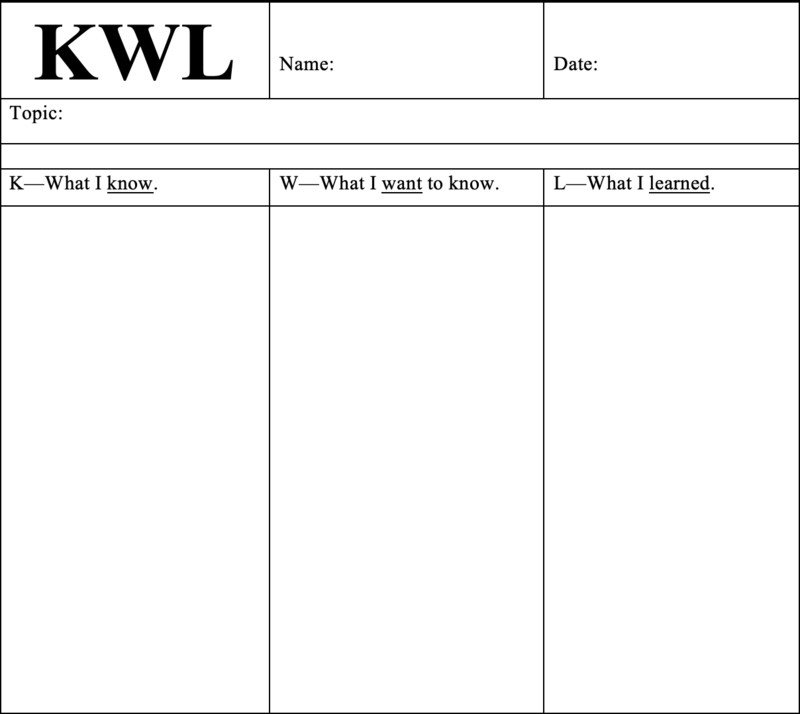 The K/W/L chart should be kept and referred to during each successive lesson, recording the content learned by students. “Honoring Tribal Legacies” is a journey of healing. Understanding the unique nature of the Northern Plains tribal cultures is important because many tribal communities have been long misunderstood and inadequately represented in mainstream history books. Background: This lesson begins with the instructor facilitating the creation of a K/W/L chart. The K/W/L chart is probably created most easily on a dry erase board, which students then record on their own paper. The class will drive the process by providing questions for research. After the introduction of the K/W/L chart, students will form small groups of four and read the essay written about the tribal culture of the Northern Plains before Lewis and Clark. After the completion of the reading, the teacher will help complete the classroom K/W/L chart and then ask the student groups to complete the Concept Map handout. Entry Question(s): What do we already know about the Northern Plains tribes? What would we like to learn about the tribal people of the Northern Plains? Materials: Written materials provided by the teacher. A personal K/W/L chart on a paper. An example of a concept map so that students can create their own version using their K/W/L charts. Tribal music of the Great Plains. Continental relief map of the U.S.
Auditory: students can listen to the tribal music of the Great Plains while completing their assignment. Free music can be found online. Visual: continental maps should be available to reference the landscape being discussed. Kinesthetic: the students could reenact the movements of Northern Plains people by moving around the room in a circular fashion, at 15-minute intervals to mark the seasonal travels. Tactile: Teachers can provide 3-D relief maps to allow students to touch the mountains and plains while they learn about the history and culture of the region of Montana. Situated Practice: Students engage in the K/W/L chart as individual and collective learners. They can provide answers about their own personal knowledge and questions, and ultimately what they learned about Native cultures along the Lewis and Clark Trail. Overt Instruction: Instructors facilitate the class K/W/L chart and utilize the written portion of the lesson to familiarize students with the topic. Critical Framing: Students consider their own region and what the local agricultural economy consists of; do they live in a fruit growing area, a wheat region, and why? Transformed Practice: Students will learn about topics and questions that are relevant to them and will help them acquire a more accurate understanding of traditional native culture throughout America, and specifically the Northern Plains. Long before the Lewis and Clark Expedition ventured into the Northern Plains along the Missouri River, Native American tribal communities had discovered the secrets to surviving the extreme climate of the region to thrive as hunter-gatherer-traders. The 13,000-year-old traditional hunter-gatherer-trade culture of the Great Plains tribes, and particularly that of the Northern Plains Indians, who occupied a vast grasslands region that we now know of as Alberta, Montana, Wyoming, and North and South Dakota, was remarkably unique in world history. Blessed with the most immense numbers of bison, elk, and deer on the planet, ancient communities of the Northern Plains lived in a land unsurpassed in its supply of wild game. William Clark, of the famed Lewis and Clark Expedition, wrote of his voyage along the Yellowstone River, “The whole face of the country was covered with herds of Buffaloe, Elk and Antelope…. We can send out at any time and obtain whatever species of meat the country affords in as large quantity as we wish.” In fact, the tens of millions of wild ungulates on the Great Plains before European contact constituted the largest single biomass in global history, with more than 60 million bison roaming and feeding freely throughout a grassland of over 500,000 square miles. A true hunter’s paradise, the region of the Northern Great Plains was not only filled with seemingly unlimited animals to harvest for meat, clothing, housing, and tools, but also with an abundance of healthful wild plants, such as roots and berries. In many ways, the tribal cultures of the Northern Plains were the most resource rich hunting, gathering, and trading cultures in world history. When the spring rains and mountain snowmelts began to swell and flood the riverbanks at the end of winter, tribal villages moved their lodges and shifted into summer activities. Swarms of mosquitoes and predatory grizzly bears also made living along the rivers an uncomfortable and risky situation. The longer days and fairer weather brought tribal communities to the high prairie, where they enjoyed the fat of the land and engaged with their friends and seasonal trade partners. Wild plants and animals were abundant during the warm weather months, making travel a resource rich endeavor. Trade items that were usually fashioned during the long winter, became a paramount part of tribal travels: brain-tanned buckskin clothing decorated with woven, colored porcupine quills, along with innumerable other personal items, such as bison-hoof sunglasses, bone awls, tanned fur blankets, medicinal plants like echinacea, yarrow, elderberry, bear root, peppermint, sage, sweet grass and sweet pine needles, along with anything and everything that was useful, beautiful, and valuable, which was also traded during the days of fair weather travel. Before horses became a part of their lives in the 18th century, and even after tribal communities had acquired them from trade partners to the South, the Northern Plains people followed a seasonal circular path. Venturing far from their wintering sites, whole communities and smaller trade groups crossed the open prairie to not-so-distant island mountains that dot Montana’s landscape east of the Rocky Mountains. These many island mountain ranges were what made the Montana plains an ideal landscape for hunter-gatherer-trader communities, as they harnessed the fresh spring water, lodge poles, animal and plant species, and utilized the spiritual and ceremonial sites that their ancestors had depended upon since time immemorial. In the shadow of these island mountain ranges and often within them, diverse tribes rendezvoused to spend time with their friends, exchanging goods, funny stories, new and ancient knowledge, sacred ceremonies, treasured songs and dances, and dreams of all kinds. These seasonal meetings were at the heart of Northern Plains culture, and still exist in the 21st century. Today the pow-wows and rodeos, hand-games and Indian relay races are performed in modern settings where the English language is the most common form of communication and tribal visitors arrive in cars, vans, and pick-up trucks that often pull horse trailers. Aside from the Mandan-Hidatsa-Arikara tribes in present day North Dakota, the agricultural revolution never took hold on the Northern Plains as it did throughout much of the North American Continent over the 2,000 years before Europeans arrived in 1492. Environmental factors in the Northern Plains, such as late summers and early winters, along with frequent droughts during the months of July and August, made the farming of corn, beans, and squash a hazardous and unwise investment. The agricultural way of life that is present today in Montana wouldn’t become possible until modern irrigation was utilized to water crops, and farmers’ insurance became available to protect farmers from losing their crops to frost or hail and receiving nothing in return. The ancient and key agricultural staple foods, such as corn and potatoes, were first developed in Central and South America thousands of years before they moved to the north through local and long-distance trade. Those crops would spread throughout the continent east of the Mississippi River and provide the economic foundation for one of the largest and most industrious cities in the Americas, a massive and wealthy settlement known as Cahokia. At its height in the 15th century, it was the largest city in the world. Now the city of St. Louis sits over large areas of the zone where it once thrived. The Iroquois Confederacy of the northeastern region, around present-day Connecticut, New York, Massachusetts, and Pennsylvania was a multi-tribal group that grew an abundance of corn and taught the English Pilgrims much about their agricultural foods and practices. There were the great crop farmers of the southeastern area of the continent; the Cherokee, Choctaw, Chickasaw, and Creek had great farming success in a region that is now Georgia, Alabama, Tennessee, and Arkansas. Even the tribes of the desert southwest, such as the Hopi, Acoma, Zuni, and Dine, found a way to grow “the three sisters,” corn, beans and squash, in modern day New Mexico, Utah, Colorado, and Arizona. The only regions truly left out of the agricultural revolution were the Northern Plains, much of the west coast, and the high plateau country that is located between those two geographically divergent areas. The tribes of these richly endowed regions chose to harvest their food from the abundant wild resources at their disposal: bison on the Plains, fish and nut trees in the West. Life was not easier for the people of the Northern Plains, but it was more dynamic because of their extensive seasonal travels and large trade networks that required much interaction with neighboring tribes.